Whether spring break means “road trip” or “staycation” for your family, one thing’s for certain: everybody needs something to read. Pop in for a visit and stock up, or shop online from this list of our staffers’ latest favorites for all ages. We’d love to know what the young readers in your life are loving these days, too. Jump into the conversation on Facebook, Twitter, or Instagram and let us know! Jerome loves words, and he collects them wherever he goes. He finds the power in small words, like “I’m sorry,” “Thank you,” and “You matter.” He finds the joy in words to create poems and songs that delight others. Finally, he finds happiness in sharing his word collection with others. I just love the watercolor illustrations in this book. Mae misses her garden when her family moves to the city, but not only does she manage to locate greenery in the city, she even finds a way to share it. When the great thing that Taylor built falls apart, all of the animals have different ideas about what Taylor should do to move on and feel better, but Taylor doesn’t feel like trying any of their ideas until the rabbit approaches, sits quietly next to Taylor, and listens. Every element of this picture book — text, typography, illustration, white space, page turns, design — is absolutely perfect. 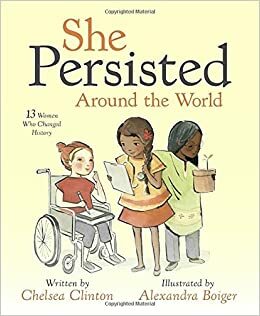 This is a book that should be on every child’s shelf. I swear, you can almost smell the sweetness of fresh spring grass in Matt Phelan’s wonderful and playful Pignic. With spare text accompanied by Matt’s signature illustration style — soft lines, expressive faces created in just a few pencil strokes, elevated here with bright watercolors — Pignic will inspire you to get outside and enjoy the springtime! I read this as a bedtime story to a child recently and was enchanted by the rhyming structure and meticulous illustrations. The book is loosely based on the true story of a circus ship that wrecked off the coast of Maine in 1836, prompting the animals to swim ashore and immerse themselves in a quaint seaside community. Fun fact: Van Dusen is also the illustrator of the fantastic Mercy Watson series! Readers will LOVE the clever hide-and-seek spread that invites you to hunt for the hiding animals. This early reader/graphic novel combo is a fun story for beginning readers. It’s also a visual treat, with illustrations by Brian Selznick (The Invention of Hugo Cabret). I could spend hours looking at the clues in Baby Monkey’s office decor and reading the “Index” at the end. I love the Owl Diaries series because it’s so fun to read chapter books that are formatted like someone’s private journal — especially the diary of a spunky owl, Eva, who is always getting into adventures and learning lessons along the way. In the latest installment (#8): can Eva save a lost pony while caught in a storm? Perfect for growing readers who are expanding their chapter book repertoire. Brace yourself: there’s a new book in the nail-biting I Survived series about one of the deadliest blizzards in American history. Let’s be real, the COOLEST way to learn about history is through the perspective of a kid who survived it. This entire series is both educational and edge-of-your-seat exciting. I’ve been trying to cook with my kids more, and we love this guide because it offers multiple photos for each recipe. A fairy-in-training must discover her inner strength as she struggles to grant wishes in a world where magic is losing steam. Read this if you loved Ella Enchanted, A Snicker of Magic, or any story where real life and magic intersect. Ivy’s world is already shaky when a tornado comes along and destroys her home; but with the help of friends and unexpected allies, the spunky, resilient Ivy is up to the challenge. I found this novel absolutely perfect and a beautiful look at the pain of first tragedies and the innocence of first crushes. I never thought about the similiarities between the seemingly opposite worlds of space and sea before. This cool book explains the details of exploring both areas. It’s filled with great information, quotes from scientists, photos and diagrams, as well as activities to try — I learned so much while reading this! Tess is a young girl disenchanted with her life, so she travels across the world to make something of it. This book is fantastic for anyone who wants to read a good old-fashioned adventure story. This book is perfect in every single way imaginable. It’s a thrilling, action-packed book with superpowers, ancient temples, and a fight for freedom. This is for anyone who loved Leigh Bardugo’s Grisha trilogy and Laini Taylor’s Strange the Dreamer. A lovely and mischievous visual delight! The Prince and the Dressmaker is a heartwarming story about being who you are and supporting the people you love. Tempests & Slaughter is a gorgeous fantasy no one should miss! The mixture of different magics, dangerous intrigue, and amazing characters left me completely satisfied (and paradoxically anxiously awaiting the next book in the series). I can’t imagine a more important time to tell stories that educate young people about the dangers and difficulties kids around the world face. This one, about the Syrian refugee crisis, is told from the perspective of Tareq, a boy and his family seeking to flee his war-torn country. But this beautiful book is not a political story as much as it is a profoundly human one. In the town of Saintstone, your deeds and character — everything that makes you who you are — are tattooed on your skin. When Leora’s father dies, his tattoos tell the story of a good man, until Leora catches a glimpse of a hidden tattoo that hides a terrible truth. Alice Broadway’s debut novel is full of lyrical prose and unique worldbuilding that kept me turning the pages late into the night. Our latest ParnassusNext selection is Emily X.R. Pan’s debut novel The Astonishing Color of After, a gut-wrenchingly gorgeous story of grief and family set against the backdrop of contemporary Taiwan. On the afternoon that 15-year-old aspiring artist Leigh Chen Sanders finally kisses her best friend, Axel, she returns home to discover that her mother has taken her own life. In the aftermath of this loss, Leigh’s father takes her to Taiwan to stay with the maternal grandparents she has never met, and Leigh becomes convinced that giant red bird that keeps appearing to her where no one else can see it is, in fact, her mother. As she gets to know her grandparents and learns more about her mother’s life before she came to the US and met her father, Leigh begins to uncover events in her family’s history that have had ripple effects through time and even on her own life. Pan’s novel movingly explores the landscape of loss, perfectly capturing the way loss can transform the very fabric of the world and the way we move through it. But Leigh’s journey is not solely about coming to terms with her mother’s death. She must untangle her feelings (already complicated and now even moreso) toward Axel; work to help her father understand and support her future as an artist; and find ways to connect with Taiwan and her Taiwanese family, both of which feel simultaneously familiar and strange, as if they hold inscrutable answers to questions Leigh doesn’t know she needs to ask. In addition to containing a tightly structured, emotionally sprawling story, Pan’s novel also features some of the most breathtaking prose I’ve ever encountered. Pan crafts sentences so beautiful you’ll want to frame them like one of Leigh’s drawings and hang them on your walls. I found myself torn between hanging on every word and turning the pages as fast as I could. We’re not alone in our enthusiasm for this book, either. The Astonishing Color of After has received three starred reviews and advance praise from the likes of Holly Black, who raved, “This beautiful, magical journey through grief made my heart take flight,” Gayle Forman, who called it “inventive and heart-wrenching,” and John Green, who declared, “This is a very special book.” Now it’s your turn to love it. Every member of ParnassusNext receives a first edition hardcover of each month’s selected book, signed by the author. There is no membership fee to join — and no line to stand in for the autograph. You’re billed just for the cost of each book (+ shipping). Not only will you have one of the best YA books of the month when it comes out, you’ll have it straight from the author’s hands, with an original, authentic signature! Choose 3, 6, or 12 months for yourself, or buy a gift membership for your favorite YA reader. Big Events! Have you had a look at the Parnassus events calendar lately? Helene Dunbar, author of Boomerang: 3/09/2018, 6:30 p.m.
Peter Brown, author of The Wild Robot Escapes: 3/22/2018, 4:30 p.m.
Wardrobe refresh: Nothing says springtime like these adorable onesies for our youngest readers — perfect for the beach or an Easter basket. Bring the kiddos to Parnassus for storytime. As always, we host Saturday storytime weekly at 10:30 a.m., and sing-along storytime with Emily Arrow on Thursday afternoons at 4 p.m. See you there!